In each March and April, most fruits in Xishuangbanna are still growing on trees, while the elaeagnus conferta roxb fruits, which get ripe earlier, have already been sold on the markets. 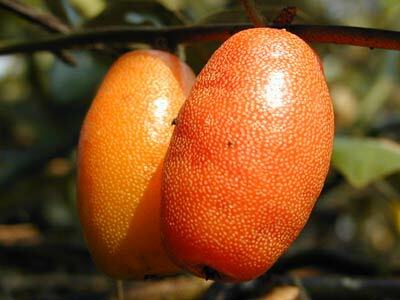 The fruits of elaeagnus conferta roxb, red in color, are elliptical and as big as pigeon's eggs. If someone puts a fruit in his mouth, bites it slightly, the sour juice in it will burst out. Since the fruit is too sour, one may feel his teeth become softened. If the fruits are saturated with some sugar water, the flavor will be much better. Elaeagnus conferta roxb is a kind of vivacious evergreen shrub. It originates in tropical Asia, and can be found in Vietnam, Malaysia, India, Yunnan and South Guangxi of China today. The florescence of elaeagnus conferta roxb is from October to November, and its fructifying period is from March to April; the fruit is rich in nutrition and the edible rate of the fruits can be as high as 73.3 -91%. Each 100% ripe fruit contains 90.6% of water, 2.45% of protein, 2.8% of coarse fat, 5.1% of sugar, and 1.45% of amino acid etc. The fruits are juicy, and can be eaten fresh. The fruits can also be made into juice, soda water, canned fruits and syrups etc. Since the fruits get ripe earlier, they can be used as a new variety of fruits in the off-season. Elaeagnus conferta roxb roots, leaves and fruit pulps are medicines, and they can cure people of indigestion, cough, and waist injury etc. Elaeagnus conferta roxb usually grow in mountain areas or in sunny valleys; sometimes, they even grow on Malachi trees and thus forms the miraculous scenes of "one tree growing on the other". As the people's living standard improves, elaeagnus conferta roxb is often used as an ornamental plant to make decorations.